Manchester United have seldom seen a happier face than that of Ole Gunnar Solskjaer after being handed over the permanent reigns of the club earlier in the week. His side then went on to defeat Watford 2-1 at Old Trafford, a game that wasn’t the best in terms of the side’s performance, but one where they’ll graciously lap up all three points. The Red Devils are still very much in the top-four race, and will likely remain contenders until the end of the season. After that, Solskjaer and company will have to start looking at options for the upcoming transfer window. While players coming in will form a major crux of their plans, the potential exits also beg a closer eye; particularly those that they can’t afford to lose. Over the international break, Paul Pogba expressed a rather strong affinity for Real Madrid, labeling it a ‘dream’ club. Coupled with the fact that they are presently helmed by Zinedine Zidane, who is Pogba’s childhood hero, it is easy to see why more than one pundit may be linking the midfielder to the Spanish capital. 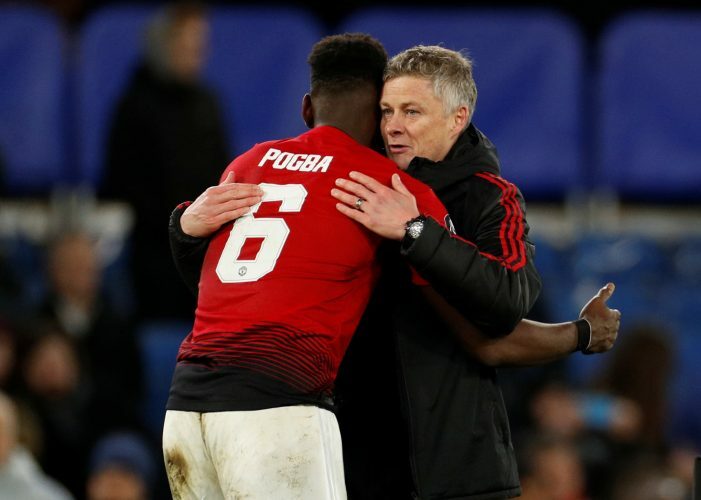 Solskjaer was confronted with this possibility during a press conference on Monday, and his response was intriguing. He went on to add: “Zidane is an icon in France, Zidane is a fantastic manager, he used to be a fantastic player – I played against him myself – and Paul has just politely answered that question. Ample reason to stay, innit?